The geographical location of exhibitors was as wide and varied as their products. This proved ideal for the large number of visitors. 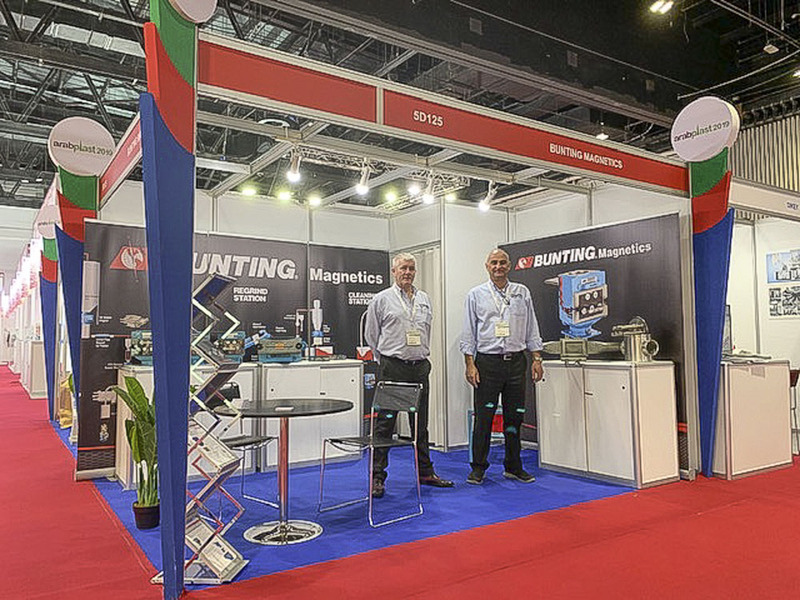 “This year’s ArabPlast exhibition replicated the success of 2017,” said Dave Hills, Bunting Magnetics Europe’s Head of Sales. The Middle East plastics industry is expanding. Established companies are investing and new businesses are emerging. “This is a very dynamic market,” said Dave. “Having a presence as a market grows is vitally important. Irrespective of the United Kingdom’s impending exit of the European Union (BREXIT), it is important for British-based companies to expand business overseas. ArabPlast provided the perfect platform to develop relationships in the Middle East.” The British Plastics Federation also had a stand at the show, highlighting the opportunities for the UK plastics industries. At ArabPlast, the Bunting team of Dave Hills and Mark Harris were assisting companies address the problem of metal contamination. Such metal causes product defects (increasing rejects) and damages processing equipment. Successful removal is commonly achieved with a Magnetic Separator or Metal Detector. On the stand, Bunting exhibited a wide range of equipment including FF Drawer Filter Magnets and Free Fall Metal Detectors. Bunting received enquiries for a wide range of metal separation equipment.